Google (Partners: AOL, Compuserve, AT&T Worldnest, Earthlink, Netscape, NYTimes.com, iWon and About.com) and it's content networks. Yahoo (Partners: Yahoo!, MSN, CNN, Alta Vista, AlltheWeb, Sympatico.ca, Infospace, DogPile, NBCi, Canada.com, Excite, WebCrawler, Metacrawler and Go2Net) and it's content networks. MSN (Partners:MSN Money, WSJ.com, Marketwatch, Barron’s, BigCharts.com, Virtualstockexchange.com, Edgar Online, MSN Tech & Gadgets, MSN Fox Sports, OpinionJournal, RealestateJournal, MSN Real Estate, MSN Autos, Windows Marketplace, MSN Health & Fitness, MSN Lifestyle, MSN Travel, Encarta, MSN Games, Windows Expo, CareerJournal and CollegeJournal). Ask.com (Partners: As the fourth largest search network, ASL connects you with the 73 million unique users in their search network). Search space is HUGE; over 300 million queries a day! Miva (Partners: Lycos, Excite.com, WebCrawler, Metacrawler, DogPile, Search.com, Superpages, Reunion, AlmondNet, SearchFeed, MemoLink, BizJournals.com, Cometsearch.com and Mamma.com) and it’s content networks. Looksmart (Partners: CNET, InfoSpace, Cox, Interactive, Mamma.com, BrainFox, Findology, Superology.com and GenieKnows) and it’s content networks. 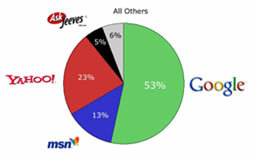 7Search (Partners: 37.com, BotBot.com, MegaSpider.com, Megaweb.com and Coolhits.com) and it’s content networks. Enhance Interactive (Partners: Excite, Earthlink and MSN) and it’s content networks. ePilot (Partners: YellowPages.com, Index.com, SearchBug.com, FindtheWeb.com and Locate.com) and it’s content networks. Kanoodle (Partners: DogPile.com, CBS MarketWatch, Galaxy.com and 37.com) and it’s content networks. Lycos (Partners: Lycos Search, HotBot, Tripod, Angelfire and Gamesville) and it’s content networks. …and other networks such as Mirago (UK), Adbrite, Search123, Searchfeed, ABCsearch, GoClick, Findology, Marchex AdHere and FindIt Quick‏ that we are working on getting to know better.